The birth of your child should be one of the most joyous moments of your life, but there are always risks. In some cases, such as when a delivery becomes distressing for the fetus or the mother, an obstetrician or midwife should move quickly to recommend and perform a C-section. He or she must also provide adequate warning of the risks and dangers associated with both vaginal and C-section births. If those requirements are not met, you may be within your rights to pursue compensation for ongoing medical expenses and the pain and suffering associated with birth trauma for you or your child. The seasoned medical malpractice attorneys at Fronzuto Law Group have over 75 years of combined experience advocating for victims of medical and pediatric malpractice, hospital negligence, and birth injuries. With millions of dollars in verdicts and settlements behind us, and over $25 million in the last three years alone, we produce results by devising cutting-edge strategies for achieving maximum compensation. In addition, we are selective in our approach to new cases in order to provide the utmost attention to each client’s needs. Ultimately, our firm bridges the gap between legal experience and compassionate, client support. To speak to an attorney at the Fronzuto Law Group, contact our office in Woodland Park, New Jersey, toll free at 888-409-0816, locally at 973-435-4551 or send us an email to schedule a free consultation. What is a Cesarean (C-Section) Delivery? A cesarean delivery (or C-section) is a surgical procedure in which a doctor delivers the child by making an incision in the mother’s abdomen and uterus. The fact that the surgery involves the abdomen means that any mistake by the doctor can have catastrophic consequences. When a complication arises during pregnancy, it is often necessary for doctors to perform a cesarean section. However, C-sections are not limited to emergency deliveries that pose health complications. In fact, many C-sections are planned well in advance by the doctor. In recent years, there has been a rise in the total number of C-section deliveries in U.S. hospitals, including New Jersey. Even a planned C-section poses severe health risks. The increasing number of C-sections means that more and more mothers, and their children, are being exposed to significant health risks. That’s because a C-section is a very serious surgical procedure that necessarily involves certain dangers. If the doctor is not careful and fails to exercise caution during a C-section delivery, an error becomes more likely. That’s why it is imperative that doctors and medical staff take the time to plan the birth and monitor the mother throughout the pregnancy. Each of the aforementioned errors is incredibly serious and may spell catastrophic consequences. Learn more about specific situations in which C-section errors may occur below. The obstetrician, midwife, or other medical personnel must monitor the mother during the pregnancy and, when needed, call for a cesarean section delivery. 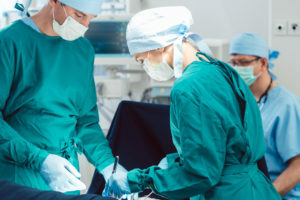 The failure to identify when a C-section is necessary, coupled with the failure to perform the surgery, may constitute a form of medical malpractice. This means that doctors are expected to be on the lookout for signs and symptoms of fetal distress, such as abnormal fetal heart rate, rapid breathing, and other indications of newborn respiratory distress syndrome (RDS). Doctors should also be aware of certain risk factors, such as the mother’s history of gestational diabetes, an unusually large baby, and abnormal positioning of the baby in the wound that would lead to a breech birth. When a baby presents with signs of fetal distress, failure to perform a C-section or delayed C-section may lead to Hypoxia (deprivation of oxygen to the body), Brain or nerve damage, Cerebral palsy, or other neurological impairments. In other cases, certain prenatal conditions indicate the necessity for a C-section delivery. In the case that the mother is experiencing eclampsia or preeclampsia, both the mother and baby are at risk for serious injury or even death if a timely C-section if not performed. Additionally, mothers with gestational diabetes often have babies that develop fetal macrosomia, which is marked by unusually large size and higher than average weight (over 9 pounds). Babies that are unusually large are at greater risk for birth injuries, including brachial plexus injuries, shoulder dystocia and associated conditions such as Erb’s Palsy, if doctors attempt to deliver them through the birth canal. In still other cases, such as those involving twins or triplets, or cases in which the baby is positioned abnormally (i.e. breech or transverse presentation) failing to order and perform a C-section can be significantly harmful, if not deadly. When an emergency delivery is necessary to save the life of the mother and/or the baby, it is critical that doctors act quickly and decisively by performing a C-section or taking some other action. The urgency of the situation when a pregnancy complication arises calls for immediate diagnosis of the medical problem, often followed by a cesarean section delivery. When there is any unnecessary delay in performing a C-section, the baby can suffer irreparable harm due to oxygen deprivation. The longer the baby goes without being able to breathe properly, the more likely it is that the baby will suffer severe, lifelong injuries. When a doctor determines that a C-section delivery is needed to protect the health of the mother and/or the baby, it must be performed safely. Unfortunately, not every C-section delivery goes smoothly. Although increasingly common, it is still a very complicated medical procedure that presents significant risks. If a physician does, in fact, perform a C-section, errors during the surgical procedure itself may also lead to serious complications. The likelihood of a serious birth injury is greater when the doctor performing the C-section commits an error during the surgery. For example, improperly performed C-sections can lead to fetal injuries such as bruises, lacerations, broken bones, and oxygen deprivation. They can also result in injuries to the mother, including damage to internal organs, as well as infections or sepsis resulting from negligent wound closure. Depending on the type of error, both the mother and the newborn could sustain significant injuries. A C-section error has the potential to cause severe harm to the mother and/or the child, including wrongful death. Bowel perforation – If the doctor does not exercise care during the C-section delivery and perforates a bowel, it can lead to infection in the abdomen and sepsis. Fetal laceration – Improper medical procedure can cause nicks and cuts and ultimately result in severe injuries to the newborn, including skin lacerations, brachial plexus injuries, cervical cord damage, and Erb’s palsy. Broken bones – An improperly or negligently performed C-section that involves the doctor applying too much pressure while removing or repositioning the baby can cause bone fractures because the newborn’s body is incredibly fragile, especially if it is a premature birth. Blood loss – Since a C-section delivery necessarily involves more blood loss than a standard vaginal birth, there is a risk of excessive loss of blood that may require a blood transfusion to the save the mother’s life. Infection – Anytime a C-section is performed, there is a chance of bacterial infection to the mother, with the infection affecting the uterus, kidneys, and bladder. For example, the doctor may negligently close the wound after the C-section delivery, causing sepsis in the mother. Respiratory complications – A C-section delivery can cause the release of additional lung fluid, making it hard for the baby to breathe and resulting in respiratory difficulties. Premature birth injuries – When labor is induced before the fetus is full-term, there exists the potential for significant injury or illness. If doctors determine that an emergency C-section delivery is necessary to save the baby’s life, it can put the baby at risk of premature birth injuries because the baby is likely to be smaller and more fragile when delivered early. Anesthesia error injuries – The use of anesthesia before a C-section delivery exposes the mother to additional risks, including anesthesia dosage errors, infections, and other complications. A C-section delivery poses health risks to both the mother and the child. When something goes wrong during labor or delivery, and a C-section error occurs, you may have the right to take legal action. Investigating a C-section error case and pursuing a claim can be extremely complicated. If you or your child suffered injuries due to cesarean section mistakes in New Jersey, it imperative that you talk to a qualified medical malpractice attorney and explore your legal options. The legal team at Fronzuto Law has extensive experience handling these types of cases and we are here to help. To speak with one of our highly knowledgeable New Jersey Cesarean Malpractice Attorneys today, contact our offices in Passaic County, New Jersey, toll free at 888-409-0816, locally at 973-435-4551 or send us an email to schedule a free consultation. The answers to your pressing questions are just a phone call away.